Most of the summer Mr. L and I have been hooked on Italian mortadella. We were in the deli at our favorite grocery store buying regular mortadella one week when we noticed the Italian version on sale for about $5 more. Could the Italian version be worth that much more? Oh yeah. Big difference. Ever since then we've been buying slices of it at Cosentinos or the local Italian deli, La Villa. We haven't been using it in sandwiches, we've just been eating those delicious thin slices out of hand as a snack or appetizer before dinner. Then came Anthony Bourdain. In his show No Reservations, he made a trip to Sao Paolo, Brazil where he had these amazing looking mortadella sandwiches. I could sense Mr. L next to me drooling over the sandwich and making plans to visit Brazil as soon as possible just to try one. I made a mental note that as soon as I had a chance, a good mortadella sandwich needed to be on the menu. Knowing that Mr. L would be preoccupied this weekend with some video games household projects, I figured a simple sandwich that he could eat quickly and get back to his game projects would be the best. So I headed to the store, got a pound of thinly sliced mortadella, some sourdough bread and planned Saturday nights meal. But then I got to thinking...does sourdough go with mortadella? Should I use Dijon mustard or would plain old yellow Frenches work best? Do I put tomatoes on that? And just what did they do to that sandwich in Sao Paolo that made it so good? But it's a SANDWICH fer cryin out loud. Shouldn't I just wing it? Shouldn't I just know this? Alas, I wanted to make this sandwich the best that I could so I swallowed my wannabe foodie pride and looked up "mortadella sandwich" on the internet. 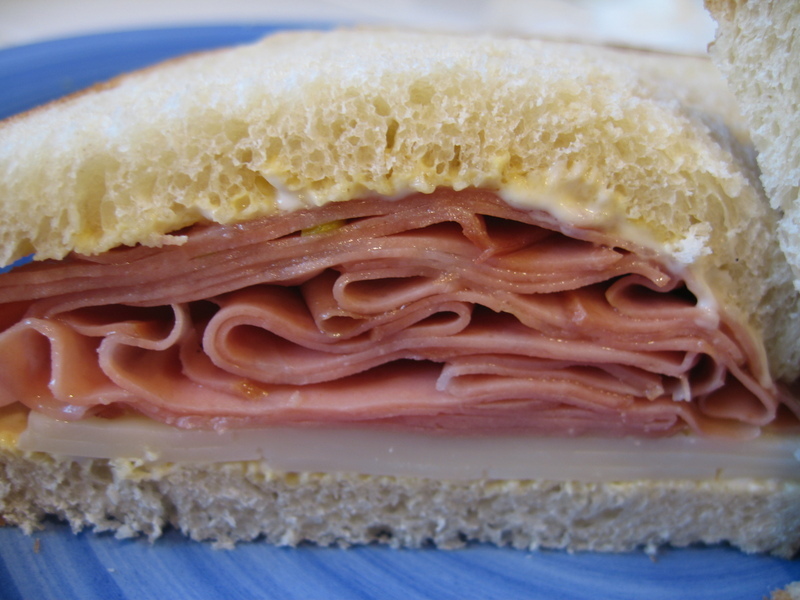 I found this article on Wise Geek that explains what mortadella is. It is an Italian cured pork sausage that is "first ground and then mashed into a paste". Ugh. Doesn't sound very appetizing does it? Maybe I shouldn't read much more on what goes in this stuff? But I kept going..."in addition to pork, mortadella is studded with pork fat taken from the throat of the pig"...okay, so that explains the yummy white stuff embedded throughout the slices, and I'm all for pork fat, but why did saying it came from the throat just make me shudder? Remind me next time to just eat things without questioning what's in them! At least I confirmed that the "green things" are just pistachios and not something that would turn me off mortadella forever. But alas, this article didn't have any recipes. It did say that the meat was usually combined with provolone so I was glad I had picked up some slices while getting the mortadella and bread. I then came across several recipes for "grinders"...salami, mortadella, provolone and swiss...sounds like a great sandwich and I book marked several recipes for future reference. This one from the Food Network sounded easy and good. But then, Jackpot! I came across a food blog called Seriously Good by Kevin Weeks. He too had seen that No Reservations episode and had since had a craving for a good mortadella sandwich, so I read his post for ideas. And then I hit the mother lode, the little tip that I new I had been searching for. After doing his own research Kevin found that the mortadella for these sandwiches is usually grilled. AHA! He mentioned Fried Bologna Sandwiches but I don't remember having any of those as a kid (though I do remember fried hot dogs and mayonnaise on Wonder Bread at my Auntie Carmens) so it would never have occurred to me either to fry or grill the mortadella. Thanks to Kevin I found the tidbit that I knew would make a better sandwich. (as an FYI, he couldn't find any word on the best bread either). The sandwich turned out pretty damn good. Much better than just plopping the mortadella down on some bread and eating it cold. Next time I might try different breads (maybe a Dutch crunch? ), toasting the bread first, different mustards, melting the cheese into the bread before adding the grilled or fried mortadella...but even as simple and plain as this was, it was one tasty sandwich. Do check out Kevin's Seriously Good blog. I've been going back through his archives all weekend marking down recipes to try. And I swear if I hear "Help me Leon" one more time I'm going to take Leon's rocket launcher and, zombies be damned, I'm going to shoot that girl Ashley with it!! 1/2 pound thinly sliced Italian Mortadella (with several slices missing since I couldn't take Mr. L pouting that he couldn't have any until dinnertime). Cover two slices of bread with a thin coat of mayonnaise and mustard. Arrange three slices of cheese on one slice of bread. Note: Obviously just wing it with the amount of cheese, mortadella and condiments. As for how long to fry or grill the mortadella? I cooked it more than just "heated through"...don't know if that really mattered or not. oh my GOD! i LOVE fried bologna sandwiches. Hehe, Resident Evil 4 huh?